The name of the future transit bridge: What are people saying? 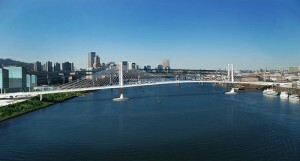 TriMet and the Portland-Milwaukie Light Rail Bridge Naming Committee released the four finalists in the naming of the new transit bridge on Wednesday morning and within 30 some hours we received more than 1,300 comments. While this is not a popularity contest to choose the final name, the public comments will help the committee and TriMet as a final decision is made. Abigail Scott Duniway is the name I like best after learning about what each possible name stood for. Tillicum is used too much in Washington, and Cascadia is pretty, but worth honoring? Not so sure. Wy’east is good, but we see Mt. Hood almost daily. Time to honor some PDX woman who pioneered our great city. Just my two cents. Abigail Scott Duniway Transit Bridge! Commemorating leadership, foresight, and tenacity. From a couple thousand miles away and working in an transit-agency in Graz/Austria myself I am impressed by the efforts TriMet and the other project-partners are undergoing in actively promoting this LRT-Project! Although I would not consider my vote as being of any relevance for the local community my favourite is “Abigail Scott Duniway Transit Bridge”. As I understand she was a key-figure in improving the life of women with long lasting positive effects – and improving life plus connecting people in a very sustainable way finally is what bridges also are made for. Abigail Scott Duniway holds a dear spot in my heart for her courage to speak out. She represents the spirit of Portland, of progress, of social change. This bridge is one of a kind and so was Abigail Scott Duniway. It’s refreshing to have something named for a woman in a sea of bridges, streets and buildings named for men. She brought the advancement of women’s rights to Oregon and is a person Portland can be proud to claim as their own. Let’s name this bridge for her! My vote is for Cascadia Crossing! A bridge represents something that unites things that are separate. The Cascadia region is a concept that crosses borders and unites lands now separated by state and national boundaries. 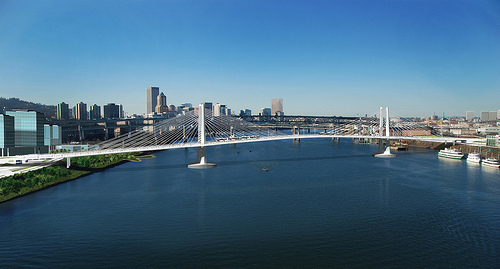 Further, the fact that it is a transit bridge represents the values of Cascadia. Cascadia Crossing is by far the best name. None of the others “ring.” It encompasses everyone, not just women or indigenous tribes. No one in Portland should be made to feel excluded by a bridge name. Cascadia!!! It’s not about a person, and it’s something we can all easily say and understand! Yes to the Tillicum Crossing – this is the one. My original thought was Chinook People’s Bridge – and had no idea there were so many others thinking the same. This is great. It seems to me that, while the other submissions are good, hitting the history of our area, the people who lived and still live here, who used and crossed the same river, makes so much sense. Cascadia is a name that is overused around town and has less impactful meaning than the rest. Tillicum. My Vote is for the ”Tillicum Crossing Transit Bridge, Bridge of the People” just because it represents Oregon’s Diversity and what the bridge is for, the people to communicate and trade just like the indigenous peoples did. While I can happily live with any of these 4 names, MY FIRST CHOICE is Tillicum Crossing Bridge – the Bridge of the people, including the FIRST people who lived here. This name will last the generations of people to follow. Wy’east would be a beautiful name. Native Americans are a terribly marginalized group and naming the bridge after Mt. Hood’s original name would be an honor to the Multnomah tribe and great step forward for the Native community. This name ties in our beautiful Mt. Hood, the Native American relationship, and it is a short, simple, and meaningful name. I like Wy’east the best!! I like the story behind it, plus it’s not as long as some of the other suggestions and easy to remember! I really like the name Wy’east for the transit bridge. It is a beautiful dedication the the history of our bountiful pacific north west. This name also honors the Native Peoples who were here before us, which is something we ought to do more often. Wy’east also has a certain ring to it which I do not feel in the other names. Thank you for your consideration of the feedback of the community and good luck with the final naming of the new bridge! I don’t think you should call it the Wy’east Transit Bridge because it sounds too much like a direction… or else a question: “why east?” I think it would ultimately cause confusion… ” Hey do you know how to get to Milwaukee?” “Sure just take the wyeast bridge.” “The what?” “The wyeast.” “Why east?” I think you catch my drift… Keep it simple. I vote for Cascadia Crossing. All four are sort of boring and poor choices. There must have been more exciting choices that would give “life” to the bridge”. I predict none of the names chosen will be used to reference the new bridge. Why don’t you name the bridge after Kirk Reeves? He brought so much joy to everyone with his music. He is an important part of recent Portland history. Although I am saddened to not see the Bifrost listed above, I think it would be honorable to recognize the First Nation peoples that originally occupied this place. I also believe that the word embodies a community spirit that the bridge is meant to function as. My vote: Tillicum. I actually think the street name, Caruthers, has a nice historical ring to it and is helpful in placing it. However, of the options, I like Tillicum best and Duniway second. I really don’t like Cascadia – it seems trite and overused. I love all the names of the top four. Maybe we need three more bridges to give the names to. Comments received during the first 24 hours of the comment period are listed on TriMet’s Accountability Center webpage. Please note: The document is unedited and may contain inappropriate language. Click here to view the document. Don’t be left out. Let us know what you think. While this is not a vote, thoughtful comments are helpful in determining a final name. Give us your comments at trimet.org/namethebridge or mail them to 1800 SW 1st Avenue, Suite 300, Portland, OR 97201. The deadline for input is 5 p.m. March 1, 2014.